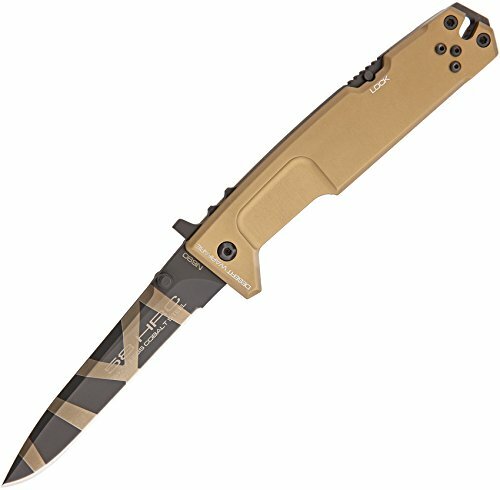 Extrema Ratio EX136NEMDW Nemesis Desert Warfare Knife by Extrema Ratio at In The National Interest. MPN: EX136NEMDW. Hurry! Limited time offer. Offer valid only while supplies last. Nemesis Desert Warfare - 5 3/4'' closed. 4 3/8'' desert warfare finish Bohler N690 stainless flat ground Italian style blade with dual thumb studs. Nemesis Desert Warfare - 5 3/4" closed. 4 3/8" desert warfare finish Bohler N690 stainless flat ground Italian style blade with dual thumb studs. Back lock blade locking mechanism. An extra manual security lock is also found on the lever and prevents the blade from closing accidentally. Desert tan anticorodal anodized aluminum handles. Lanyard hole. Black finish stainless pocket clip.